Review: KORRES Thyme Honey Moisturizing Cream | Memorable Days : Beauty Blog - Korean Beauty, European, American Product Reviews. I started to use the Thyme Honey moisturizing cream from Korres. I've been testing this product out for a month now and I'm still satisfied with it. Last year I had seen many videos on Youtube about the products of Korres and the Wild rose 24h moisturizing cream seemed to be the most popular. 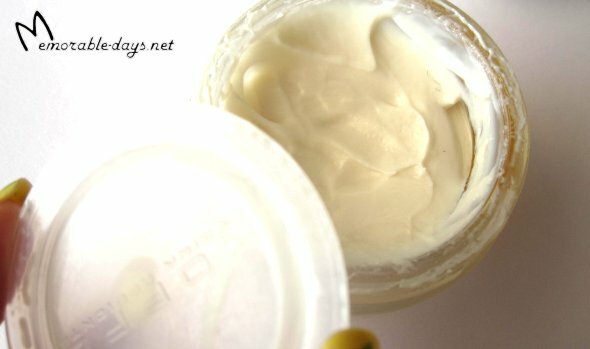 I wasn't able to get that product so I chose* the Thyme Honey moisturizing cream. This brand is well known because of the natural ingredients in their products. Honey, a natural hydrating agent, helps skin keep an ideal level of moisture, while providing intense nourishment and elasticity to dry skin. The extract of Imperata cylindrica continually regulates the cellular water equilibrium, thus providing 24-hour moisturizing. Due to its special texture, thyme honey cream absorbs easily, while leaving the skin soft and moisturized. This product is suitable for dry to dehydrated skin. Korres products are all manufactured in Greece. Their products are also sold in The Netherlands at the online store Zalando, in Germany, France, Switzerland, Australia, Cyprus, China, USA, UK, Scotland, Finland, Czech Republic and in Dubai. The product comes in a sturdy cardboard box, with an extra cover with the English version of the product information, the primary box contains the information in Greek. The boxes are also stamped with an expiry date, which is repeated on the actual product. This date on the packaging refers to unopened products. They recommend to use this product within 6 months after opening. All the packaging is marked as recyclable which is stated on the box. I actually like the look of the container more, which is made of glass and aluminum. There is an extra cover above the moisturizing cream, which I'm holding in the picture. It also comes with a small scoop, so that you're able to scoop the product out. The small scoop is very useful and hygienic. It has a honey scent, which isn't overwhelming and the cream is quite thick. This isn't suitable as a day cream because of the thick texture. It also takes a bit long to absorb into the skin. It takes at least 20-30 minutes to absorb which is way too long for me in the morning. That's why I'm using this cream at night. It also leaves a little bit of sticky feeling after applying and unfortunately it gives me an oily face in the morning =(. Thyme Honey, rich in vitamins, amino acids and flavonoids, provides antioxidant protection, while polysaccharides attract and absorb water, acting as a hydro-regulating agent ensuring ideal skin hydration. Imperata cylindrica, a desert plant extract, ensures 24-hour long-lasting hydration by continually regulating the cellular water equilibrium. Grape seed extract, rich in Vitamin E, a powerful antioxidant, helps promote healthy and youthful skin. Squalene, an olive oil derivative, increases skin elasticity and hydration. Olive oil, almost identical in chemical structure to our skin lipids, provides perfect hydration. Macadamia nut oil re-balances dryness without clogging the pores. There is a long list of "Formula Facts" on the packaging which gives more information about the ingredients. This is very useful if you want to avoid certain ingredients. On the packaging it says that it contains 85.3% natural content. It also has no mineral oil, petrolatum, silicones, parabens, propylene glycol, ethanolamines, sles, ales, synthetic dye, phtalates, retinol, wheat nor polycyclic musks. But it does contains PEG, fragrance pH-neutral, alcohol (0,2%) and nuts. This product is not tested on animals and is suitable for vegetarians. ♥ Is my face moisturized for 24 hours? My skin does feel moisturized, but not for the whole day, probably for 12 hours. ♥ Absorbs easily? It takes 20-30 minutes to absorb, depending how thick you apply it on your face. Which means that it takes a while until its completely absorbs. ♥ Leaves skin soft? A bit soft, but it also leaves me a bit of sticky feeling. This product is great as a night cream. I love it that it contains a lot of natural contents, it just gives me a better feeling while using it. It doesn't really do what it claims, but I do recommend this to people with a dry - dehydrated skin, because it does moisturizes the skin well and the dry flakes/spots on the face will go away because of this. Things that I don't like about the product is the sticky feeling afterwards, the long absorption time and the oily face that I'm getting in the morning. Because of these cons I don't think that I will purchase this product again. *This product was sponsored by the company Zalando. They didn't sell the wild rose moisturizing cream, so I wasn't able to get it. Hmm klinkt goed, ik hou van de geur van honing! Wel fijn dat het niet een hele aanwezige geur is, too much vind ik dan vaak niet lekker. Hm jammer, ik vind plakkerig en langzaam absorberend echt een van de belangrijke factoren waarom ik het niet zou kopen. Voor de rest klinkt hij goed! @Sam, ja ik ook.. plakkerig voelt niet lekker aan als je slaapt, plakt je gezicht aan je kussen x_x..
@Jennifer, some people like the scent, some don't .. this one smells like honey. I also thought it's overwhelming at first.. but it's ok when you use it more often, you will get used to the scent.